We finished off the water lines yesterday. We had to wait to do a water test until the afternoon when the kids had finished school as the bathrooms were on the same line as the school. We needed to shut down the line to tie the new line in. When we turned the water back on, surprise, there was no water. We weren’t tied into that line after all but a completely different one. That’s what happens when things are buried. When we finally figured out what line to turn on, we had water alright. We had water spraying from the back of the building. We had a leak. As it turns out, one of the joints wasn’t glued. An easy fix and we were good to go. We decided that since Loving Arms is going to tile the pads where the toilets are going to sit, we wouldn’t set the toilets. 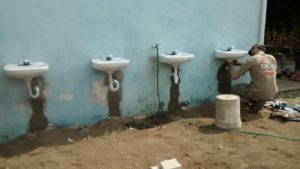 For now the 4 girl’s toilets and 3 boy’s toilets will sit in storage. 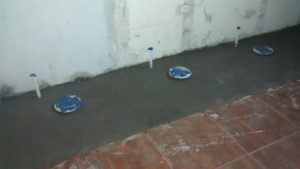 Instead we decided to pour the cement pad for the sinks. As Jim was walking around looking for wood for forms for the pad, he heard what he thought was water running in the middle of a small field. Sure enough, Water was bubbling up from the ground, like oil on the Beverly Hillbillies. The pipe had sprung a leak. Today, we are stopping at the ferreteria for fittings to repair that leak so we can walk away knowing that everything is sealed. God is good. If Jim hadn’t been walking there we may never have known about that leak. Last night we went shopping: Denny bought Guatemalan refried beans, Jim bought Guatemalan chocolate milk and Guatemalan chocolate (it tasted a little different than ours), Jonathan bought some Guatemalan imitation crocs and I bought some Guatemalan granola bars. I will enjoy my taste of Guatemala for a break today. Posted on April 16, 2018 Author Sandy RumfordCategories UncategorisedLeave a comment on Almost Complete! Yesterday on our way to the Loving Arms site, we stopped at a local hardware store, known as a ferreteria, for some parts. At first, we had to explain to our driver, Minor where we wanted to go. Minor doesn’t speak English and we don’t speak Spanish. So we got out our Google translate and gave it a shot. Sure enough we got the message through. 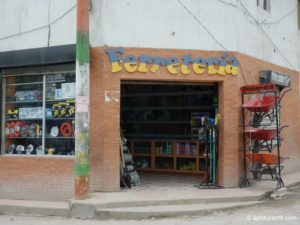 The ferreteria is like most hardware stores in the developing world, all of the parts are displayed on the wall. You either point at what you want or describe it to the clerk. That gets challenging when you don’t speak Spanish, the clerk doesn’t speak English, your driver doesn’t speak English, and the part you are looking for isn’t on the wall. We were looking for a round keyhole saw. After several failed attempts to describe it in English we resorted to a sketch. As rough as it was, we found success and rode away with a brand new keyhole saw. 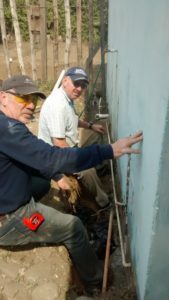 We finished up cementing and began running water lines. 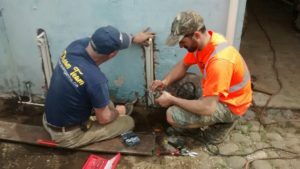 We had a minor set back when we accidentally put a hole in one of the existing water lines, but with three plumbers around, that was fixed with almost a wave of their hand. At lunch we were served a drink that looked like milk but tasted like vanilla and coconut. Very unusual. After dinner, with no cake, and no rain in site, we made our trek through the city for some gelato. I had salted peanut butter and the other guys had lemon. They sure know how to make gelato in Guatemala. Today we stop at the ferreteria again to work on our Spanish. requesting it. As an incentive, she promised us cake. We weren’t sure that the promise of cake was real, but agreed to do it as it was the right thing to do. Even though we lost some time, some young people who were travelling on another mission team, lent us a hand in making cement. 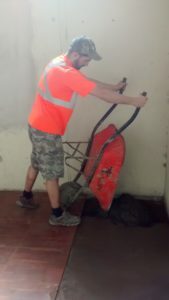 With Jonathan leading the way, we mixed up the cement on the ground and poured it into the trenches with wheelbarrows. By the end of the day, we were done. It’s amazing how the Lord provides. Back at the hotel, dinner was spaghetti. Afterwards, we felt like we needed a little dessert and decided to go for a walk and find a pastry shop. As we were about to leave Alicia stopped and said, “Where are you going? I’ve got cake.” And an amazing cake it was. Still needing our walk, especially after cake, we took off looking for the local supermarket. It was hidden way behind some other buildings and supposedly we had walked past it several times and missed it. We were intent on finding it and we did. It was huge, and very impressive. Prices so good we thought next time rather than bringing things with us, we will just buy them here. We spent more time looking around than we should have and it began to rain, a torrential downpour. Our only option was to run back to the hotel. Trying to miss the rain by hiding under their narrow eaves, we would run from one side of the street to the other hoping to find the widest eaves. The Guatemalans we would meet, huddled in their doorways, would break out laughing when they saw us, running through the streets. With no storm sewers, the water runs in the street and crossing it we got our feet soaked. By the time we made it back to the hotel, we were completely soaked in rain water and memories. What a Welcome in Parramos, Guatemala! 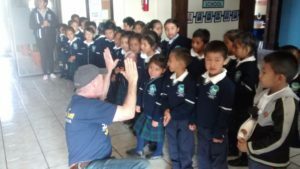 We had a great day in Parramos, Guatemala today. We drove from Antigua, along the winding roads, up the mountains to Loving Arms’ Centre of Hope. This is where the school is located. Upon arriving, we noticed the doors were closed which seemed odd for a school day. As we approached the school, the doors were flung open and all the school children were lined up on either side of the door to greet us. What a wonderful surprise. They were beautiful, in their blue and white and tartan uniforms and of course their huge smiles. High fiving us as we walked past. The work could not have gone more smoothly. This is a great team! I sometimes feel as if I am standing still as I watch these guys buzz around me. 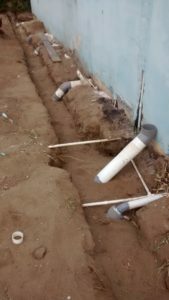 The trench to the septic tank has been completely dug out and all the piping for the toilets is completed. 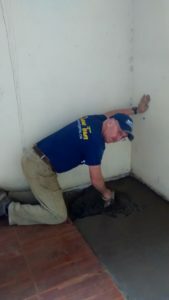 We plan on cementing the floors tomorrow. Simply amazing! God is so good! We saw a puff of smoke from the overlooking volcano today, just reminding us how small we are and how big God is. I can’t wait to see what we can accomplish tomorrow. 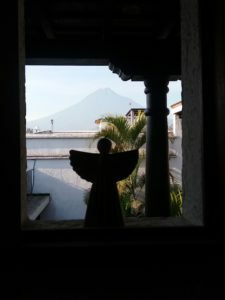 Posted on April 12, 2018 Author Sandy RumfordCategories UncategorisedLeave a comment on What a Welcome in Parramos, Guatemala!